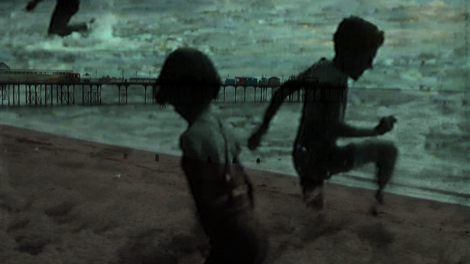 An animated ‘séance’, in which modern day Teignmouth, a seaside resort on the coast of south Devon, is haunted by joyous summers past, conjured up though archive footage. The Jones family holidayed in Teignmouth - then known as ‘The Children’s Paradise’ - from 1934 to 1939, just before the outbreak of the second world war, their summer activities captured forever on black and white film. A lifetime later the town is still here: ships in the docks, bathers on the beach, people promenade... Teign Spirit celebrates this continuity, mixing these home movies with new waves: a 21st century stroll along the Back Beach, evoking the optical entertainments of the Victorian pier: the flickering still-moving images of the mutascope, a figure seen for a moment, held in the mind, then gone. 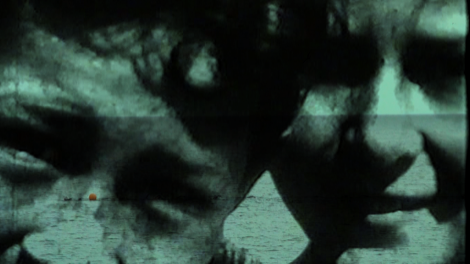 Silent memories, coloured and transformed by the present; shifting sands and elemental forces. Sea Change is an initiative of CABE the Commission for Architecture and the Built Environment, and the government's advisor on architecture, urban design and public space. Teign Spirit matches the viewpoints and sea views of black and white holiday movies with those of the present day resort, captured in digital photography; using frame-by-frame compositing to mix high definition video and 8mm monochrome footage from the 1930s, matching viewpoints and sea views of the present day. 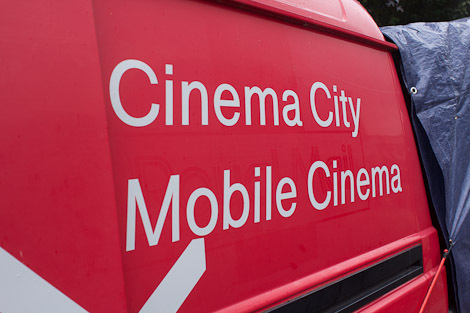 The silent black and white footage has travelled in time - film, VHS, DVD - before landing in the digital present of stop-motion photography, video and location sound recordings. 2011 Teign Spirit 360: Weymouth Documentation of the 360 version of the film projected inside the circular cinema on Weymouth beach during the London 2012 Cultural Olympiad Open Weekend in July 2011. Teign Spirit 360 presented in the ICCI360 Rotunda at Kultur+Kongress Forum, part of the 23rd International Panorama Conference, Altötting, Germany (11 to 13 September 2014). Watch RFO TV news item of the ICCI360 launch event. Welcome to the Treasuredome artists’ moving image event presented by Stuart Moore and Kayla Parker, ICCI 360 Arena, Weymouth seafront (Animate Projects programme 10 and 11 August 2012). 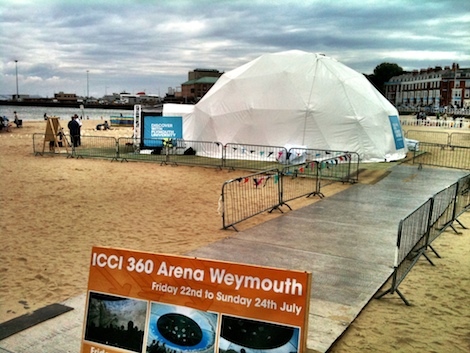 Also,Teign Spirit 360 is screening throughout the Olympics and Paralympics in the ICCI 360 Arena at Weymouth from July to September 2012. Part of Maritime Mix - London 2012 Cultural Olympiad by the Sea.